﻿ Riad Assala Marrakech. JIMAT di Agoda.com! Menawarkan penginapan yang berkualiti tinggi di daerah budaya, siar-siar, beli-belah di Marrakech, Riad Assala merupakan pilihan popular untuk kedua-dua tujuan perniagaan dan percutian. Dari sini, tetamu boleh menikmati akses mudah kepada semua yang bandar meriah ini boleh tawarkan. Dengan lokasi yang mudah, hotel ini memberikan akses mudah ke tempat yang anda perlu lawati di bandar. Menawarkan tetamu hotel perkhidmatan yang unggul dan pelbagai kemudahan, Riad Assala komited untuk memastikan penginapan anda berada di tahap seberapa selesa yang mungkin. Tetamu hotel boleh menikmati kemudahan seperti meja penyambut tetamu 24-jam, kemudahan bagi tetamu kurang upaya, simpanan bagasi, layanan bilik, pemindahan dari/ke lapangan terbang. Hotel-hotel telah direka demi keselesaan dan memudahkan tetamu. Sebahagian bilik menyediakan akses internet (wayarles), pendingin hawa, pemanas, panggilan kejut, kelengkapan dandanan. Hotel ini menawarkan kemudahan hebat, termasuk kolam renang luar, kolam renang dalam, spa, urut, solarium, untuk membantu anda berehat selepas hari yang penuh aksi di bandar. Apa juga tujuan lawatan, Riad Assala merupakan pilihan yang terbaik bagi penginapan anda di Marrakech. Superb location and great friendly service. Brilliant breakfast! from the moment we arrived for our stay at the riad assala we were made to feel right at home with a beautiful presentation of moroccan mint tea, despite the late hour. the rooms are decorated in traditional moroccan style, with each room in a different colour. the riad is in a fantastic location for getting around the souks and to the main square (jemaa el-fna) and other sightseeing attractions; all are within easy walking distance. breakfast was wonderful every day, with fresh squeezed orange juice, pastries, crepes, cakes and breads with lovely local jams and hot coffee or teas. there is a lovely terrace on the roof if you fancy catching some sun, while the courtyard and plunge pool keep in the cool regardless of the sun and heat above. my only detractor would be that despite the lovely photos, some areas of this riad could do with a little tlc - the terrace in particular was not really set up for guests to access it, no sunbeds or tables and chairs as shown in the photos, though we were able to spend some time up there regardless. i'm sure the staff would've been happy enough to move some chairs or sunbeds upstairs if asked. the service was really welcoming without being intrusive. in summary, this is a good value riad (especially if you've gotten a discount or deal as we had). it would be especially good for hiring out the whole riad as a group! 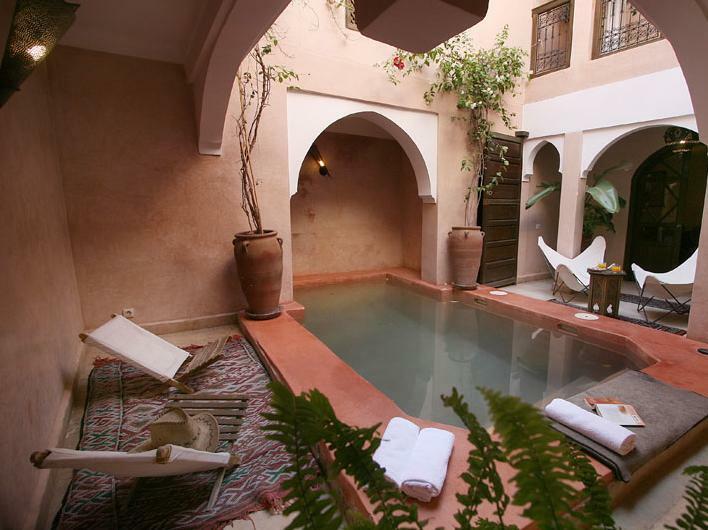 This riad would be best used not in winter. Had a heating problem with the water for the showers & the rooms. Staff tried to fix but was not successful. we found the riad to be very attractive, nice breakfast, great service. it was difficult to find however being in the souk. there aren't many plaes to eat nearby so keep that in mind if you return from the souk to realise you want a quite bit (there's a small family run cafe nearby 30 seconds away heading towards the souk) although the owner said there wasn't anywhere to eat nearby. doors to suites don't close completely due to authenticity so you'll need to keep the heater on all night in winter - not exactly practical. doesn't lock from the outside either. service was very good, although no english speakers just french. the owner tried to charge instead of when we departed - consistent with the culture, but didn't expect to experience that with accommodation, bit disappointing. good value if with a discount. Quaint riad but needs a little TLC - fresh coat of paint and attention to the electricity - lost our heat in the middle of the night and had to take cold showers. Wonderful breakfast. mein erster eindruck war verblueffend als ich vom flughafen in die innenstadt zu unserem riad fuhr (ca 15 minuten) als uns unser taxifahrer in einer engen gasse bat auszusteigen und zu fuss weiterzulaufen. kein mensch auf der strasse, es war nach mitternacht, er begleitete uns durch noch engere gassen bis wir nach ca 10 minuten an einer metallbeschlagenen holztuer ankamen. es oeffnete uns ein junger marokkaner und bat uns sehr freundlich einzutreten, zeigte uns unser zimmer und fragte wann wir am naechsten morgen fruhstuecken wollten. unser zimmer war stilvoll eingerichtet mit separatem bad, alles sehr sauber. gerne wieder. We kwamen in het naseizoen en waren de enigen (half januari), het was daarom wel wat uitgestorven en de riad functies lagen stil zoals de hammam intern. Opvallend was dat de binnenplaatsen beiden overdekt waren met transparante zeilen tegen de regen, maar dat geeft geen lekker gevoel, het direkte contact met de lucht is er dus niet: jammer. De haard in de kamer had al lang niet gebrand, er lag geen hout bij. Verder niet naar gevraagd. De eigenaar liep rokend door zijn riad en was verder vriendelijk en behulpzaam. Belangrijkste kenmerk van dit hotel is de eenvoudige en smaakvolle inrichting. Het water is er echt heet, wat je van de meeste verblijfplaatsen niet kunt zeggen. El Riad es encantador, muy bonito y tranquilo cosa que se agradece mucho después del agetreo de la ciudad, las habitaciones son muy bonitas y con mucho encanto,dispone de una pequeña piscina que se puede disfrutar las 24h sin ningun problema. El servicio es excelente y cordial ya que intentan ayudar en todo lo que pueden y solucionan las dudas que van surgiendo durante la estancia, disponen de un servicio de comidas que no esta incluido en el precio pero que es muy recomendable y se ofrece en un ambiente muy romantico. L'accueil et l'hospitalité du personnel sont exceptionnels. Le Riad est d'une grande propreté. Tout était prêt à notre arrivée. Le personnel donne suite à toutes les demandes. Le repas au Riad est copieux, aliments frais du jour et une cuisinière de grande qualité. La suite est spacieuse et agréable. Il y a en permanence une personne dans le Riad, d'une grande disponibilité. A recommander.